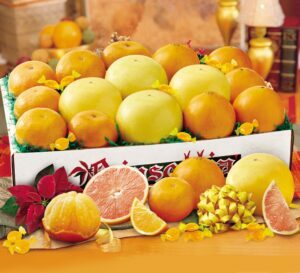 Navel Oranges, Tangelos And Ruby Red Grapefruit! Three of Florida’s most sought-after varieties arrive right in time for holiday enjoyment. Recipients will delight in classic, easy-peeling Navels, tasty Tangelos, and our world-famous Indian River Ruby Reds. We top it all off with an assortment of Candy.